In what could almost be a man bites dog story, Australian researchers have criticised Australian doctors for not prescribing enough pills. The study released this week surveyed 322 General Practitioners (family physicians) looking at their management of patients over 55 with risk factors for cardiovascular (heart) disease. Each doctor filled out a survey on 15-20 consecutive patients. The total number of patients was 5293, of which 29% had established heart disease and 22% had risk factors. The authors concluded there was “substantial under treatment of patients…” and that “ We recommend that GPs … ensure that high-risk patients receive evidence based pharmacotherapy”. It may not come as a surprise to find of the eight authors, five have been paid, in various ways by pharmaceutical companies and two are employed by a pharmaceutical company. Only one of the eight has no financial ties. Now I have no issue with people earning a living and no issue with the pharmaceutical industry promoting their wares. However, I do have an issue when the only recommendation to reduce the chances of people getting heart disease is to use more pills. Treatment of risk factors is a favorite in the pharmaceutical industry as it is lifelong therapy and a “no lose” situation as it is not the disease being treated, In other words treating risk factors means you get credit if the event does not occur and can claim to have done your best even if it does. 1) That doctors advise patients about the importance of eating more fruits and vegetables. 2) That the doctors talk to their patients about weight reduction. 3) That people be advised on the importance of Omega 3’s. 5) That stress be looked at or managed. Instead of this, the whole solution is to put more people on more pills in the hope that if enough people take enough pills that all would be well with the world. Call me one of the “bad” doctors if you like, and I am sure our researcher friends would, but I do not buy this. Conditions like heart disease, strokes, diabetes, obesity and many others are not due to a shortage of circulating pharmaceuticals in the blood stream, they are a consequence of the choices we have made over an extended period of time. The solution then is to make the changes in our diets and daily life not just to pop more pills. After doing all this, there will still be a role for some pharmaceuticals in some people, but far less than is currently suggested be prescribed. Meanwhile, just to show that not all research is a way to sell drugs, a study in the European Heart Journal has shown being happy can reduce heart disease by around 40%. The connections between the heart and happiness are legendary and like many things, which are part of human existence; there is a basis which science has not caught up with yet. To get the benefit, people did not have to be happy all the time and it did not matter if they had down periods. What mattered is that they enjoyed life overall and had some fun. This could be as simple as listening to music for 15 minutes or walking in the park, anything which you enjoyed doing. This is Pillar 8 of DIY Health 101. Advising people with their lifestyle choices and the importance of some fun in their lives is a much better role for doctors than dishing out pills even if that makes me a bad doctor in the eyes of certain researchers and their bosses. 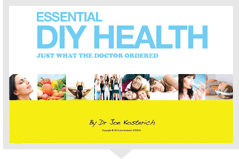 This article also appears on Prevention Not Prescriptions which is a another great site for health information.